Hector & Florence is a Woodland themed collection of accessories to use outside the cage. 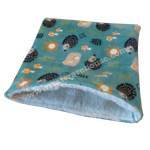 Made of a soft, deep pile fleecy fabric, you will find a bonding pouch or muff, a snuggly bag in different sizes, ideal to use at freerange time. Due to the nature of this lush fabric, it is not suitable to use inside cages housing pets who chew as it is a long thread material. The XL Rat Muff is based on an Rat Warehouse design, but it is slightly deeper. This unique pouch design has been improved and it is hugely popular. Your pets can go inside and the two openings on the sides allow you to stroke them, making this the perfect bonding pouch. It is fitted with a fully adjustable strap which is removable. Approximate dimensions: 13.5in wide x 12in tall and 9 inches at the side, below the opening. Please note that for your pets' safety, all our pouches and muffs are designed for indoor use, for outside travels and car journeys, we recommend that you use a solid, escape proof carrier. 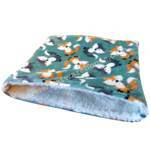 This XL Rat Muff is made of ultra soft, long pile green fleece with a grey and orange foxy print and it is lined in cream sherpa fleece. 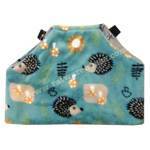 A lovely XL cuddle and bonding pouch made of ultra soft, long pile green fleece with a woodland hedgehog print, lined in cream sherpa fleece. It is roomy and deep, measuring approximately 13 inches wide and 14 inches deep so your rats can feel safe and snug inside. It is fitted with sturdy swivel clips and a wide adjustable, removable webbing strap which will allow you to carry a few pounds of rats around in comfort. This pouch is excellent to carry around new ratties, to get them to bond with you and with each other, or can be used as a snuggly retreat on the sofa at play time. Also suitable for slightly larger pets such as small pouchies and ferrets. The Rat Muff is a design exclusive to the Rat Warehouse. Our original pouch design is the best pouch design we have come across to date. It allows you to stroke your pets while they are inside, making it the perfect bonding pouch. It comes with a removable and fully adjustable strap. Hector Rat Muff is made of ultra soft, long pile green fleece with a woodland hedgehog print and it is lined in cream sherpa fleece. Approximate dimensions: 13.5in wide x 9 in tall and 5.5 inches at the side, below the opening. 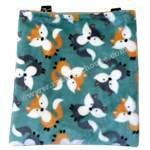 This carry and bonding pouch is made of ultra soft, long pile green fleece with a woodland hedgehog print and it is lined in cream sherpa fleece. It is roomy and deep, measuring approximately 10 inches wide by 12 inches deep so your rats can feel safe and snug inside. It is fitted with sturdy swivel clips and a wide adjustable, removable webbing strap which will allow you to carry a few pounds of rats around in comfort. This pouch is excellent to carry around new ratties, to get them to bond with you and with each other, or can be used as a snuggly retreat on the sofa at play time. 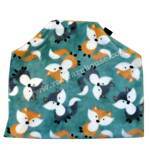 A lovely XL cuddle and bonding pouch made of ultra soft, long pile green fleece with a grey and orange foxy print, lined in cream sherpa fleece. It is roomy and deep, measuring approximately 13 inches wide and 14 inches deep so your rats can feel safe and snug inside. It is fitted with sturdy swivel clips and a wide adjustable, removable webbing strap which will allow you to carry a few pounds of rats around in comfort. This XL Rat Muff is made of ultra soft, long pile green fleece with a woodland hedgehog print and it is lined in cream sherpa fleece.